I started running as a challenge and as an accident. But once I got into it I was inspired by many. Bill Rodgers was one among them. He is also called "Boston Billy" as he won it 4 times and well known for his NYC wins as well. Qualifying for Boston was one of my first goal then after that came the running a marathon in all 50 states and then I added running a marathon in all 7 continents as the other goal. I have been doing everything but training for Boston. This year I wanted to change that and had been paying little more attention to training, nutrition and recovery. It paid off this year. As I almost cut down 10 mts from last year. Sydney Marathon was kind of a surprise for me in terms of time as I didn't go into it thinking of PR as I finished a marathon In Jackson Hole, WY just 2 weeks prior and also I summited Mt. Shasta just a week prior to running Sydney Marathon. I felt psychologically tired and little but physically tired as well. But I was glad it was a PR and I almost cut down 7 minutes. Today I felt good and wanted to push it and was doing really well until mile 24 and all of a sudden I cramped which kind of added 3 minutes or so. I was feeling really good and was in-track for sub-3:15 but ended up doing 3:18. I am still happy with my result. Very thankful and grateful that I finished almost 4 mts faster than Sydney which was my PR just 8 weeks back.. 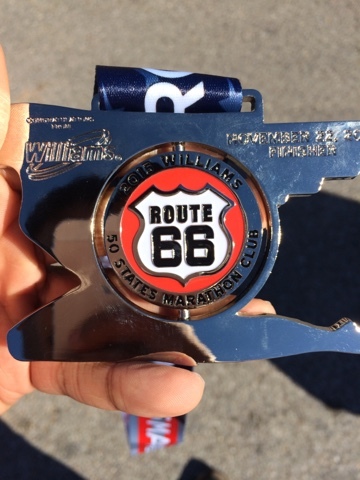 I got my PR today running the Route 66 marathon in Tulsa, OK. It was relatively hilly course but the weather was nice and it helped me accomplish this feat. This made me come little closer to my dream of qualifying for Boston. Hopefully I will be able to accomplish it by November 2016, next year. 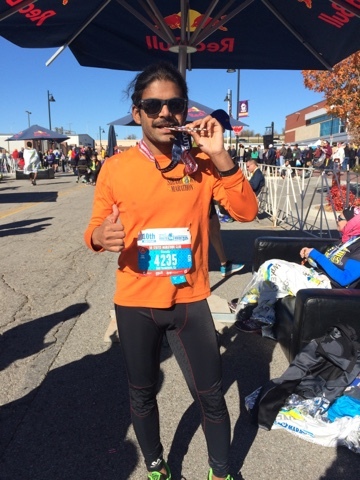 I am glad I made some good progress over the years and especially this year I cut down almost 10 minutes making me a sub 3:20 marathoner. I have 14 more minutes to cut down and I hope to put in the effort to qualify for Boston. Boston has got me started and made me committed to running and I got bit by the travel bug meanwhile which made me do lot of traveling while making progress on 50 states and 7 continents. But I will focus on the BQ which is almost like getting placed/qualified to participate in Olympics.